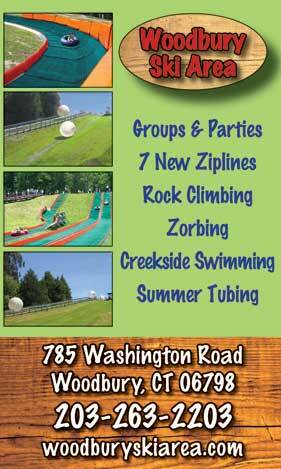 Come to Woodbury Ski Area this summer and experience Summer Tubing, Zorbing, Junior Zorbing, Aqua Zorbing, Zipline, Climbing Wall and Swimming! It is a great way to spend the day with the family. Free parking always and close to home. This summer Woodbury added several new summer activites! We now offer the excitement of winter tubing without the coats and gloves! We have over 800 feet of summer tubing runs that simulate snow tubing by allowing the tubes to ride over trails using a unique artificial turf. If the temperature is over 88 degrees, we will add misty water to the chutes to allow the tubing to go faster. Zorbing is the latest craze hitting the area! A Zorb is a transparent inflatable sphere with an air cushion surrounding it. The rider climbs into the inner sphere and enjoys a unique ride down the tubing chute. 5 new zorb balls are coming to Woodbury Ski Area! Come and try out Woodbury's new climbing wall! Great for Birthday Parties and events! Ranging from 100 ft beginner, to 300 ft intermediate, and 500 ft expert! Expert Ziplines are Equipped with state of the art Zip Stop braking system. We also have tandem ziplines, rockwall climbing, and new platforms for a better zipline experience.
! IMPORTANT, READ THIS ! Helmets are required for Zorbing for ALL ages. Enjoy two tracks of this unique summer tubing! This is a great activity for all ages. We have one beginner track and one expert track. Woo hoo! What a great way to spend a hot summer day. No waiting, no lines, super friendly and knowledgeable staff. Two can Zorb at once! Roll down The hill! Climb into the Zorba ball, get strapped in and then roll down the hill on a course specially designed for the Zorba ball. Ever seen anything like this before in your life? Come out and be thrilled!